Many clinical problems require a basic understanding of pharmacokinetics. These range from predicting how quickly a patient will respond to a change in drug regimen, to estimating doses in patients at extremes of weight or age. This tutorial covers the key terminology and some practical tips on problem solving in clinical practice. The time course of absorption, distribution, metabolism and excretion of a medicine. Think of this as: ‘what the body does to the medicine’. The biochemical and physiological effects of medicines and their mechanisms of action. This includes all the actions of a medicine not just the desirable ones – so it's about side effects too. To help you remember the difference from pharmacokinetics you could say pharmacodynamics is ‘what a medicine does to the body’. The fraction of a medicine's dose that reaches the systemic circulation as intact drug. It depends on how well the drug is absorbed and how much is removed by the liver during ‘first-pass clearance’. The volume of distribution is determined by physiological factors such as the size of the patient. For example, a 160kg young male athlete would be expected to have a larger Vd than a 40kg lady aged 83 because his blood volume and tissue size will be larger. Pharmacodynamic factors such as the affinity of the drug for the tissues compared with the plasma may also affect the Vd. 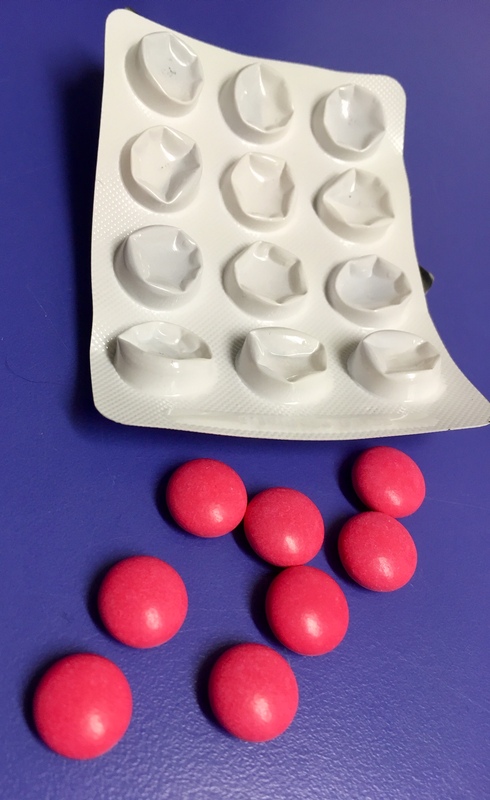 Digoxin is very tightly bound by the tissues and not held in the plasma: the drug appears to be dissolved in a large volume and thus the Vd is large (6L/kg). In contrast, warfarin is held in the plasma by proteins and does not distribute to the tissues. The Vd in this case is smaller and approximates to the actual blood volume (0.08 – 0.27L/kg). Vd helps to determine the loading dose of a drug when rapid therapeutic plasma levels are required e.g. digoxin, theophylline. This is defined as the volume of blood cleared of drug per unit time, and the units are normally litres per hour or ml per minute. It describes the ability of the body to remove a drug from blood either unchanged in the urine, gut or sweat, or after metabolic conversion. It is not an indicator of how much drug is being removed but the theoretical volume of blood or plasma that is completely cleared of drug in a given time. Clearance is important because it helps to determine the maintenance dose of a drug to achieve the desired plasma concentration. The equilibrium achieved after multiple dosing when the rate of drug administration equals the rate of drug elimination. At steady-state the amount of drug in the body, and the plasma concentration, are constant. This is a particularly important concept. It is the time taken for the amount of drug in the body (or the plasma concentration) to fall by half. The elimination of a drug is usually an exponential process meaning that a constant proportion of the drug is eliminated per unit time. Half-life is important because it determines both the time to reach steady-state conditions with chronic dosing and the time for elimination. As a rule of thumb it takes approximately 3 – 5 half-lives to achieve steady-state conditions. Drug elimination is the mirror image: it normally takes 3 – 5 half-lives for a drug to be completely eliminated from the plasma. 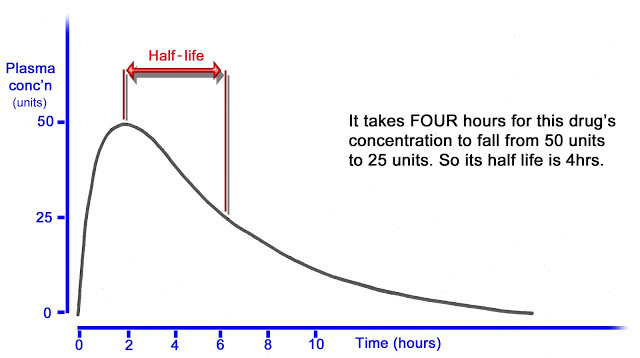 Half-life also helps to determine the frequency of dosing. The larger the Vd, the more the drug is concentrated in the tissues and not in the blood. It is only the drug in the blood that is exposed to clearance by the liver or the kidneys. Therefore increasing Vd increases half-life. A decrease in the efficiency of elimination (i.e. the clearance) will obviously increase the half-life as well.